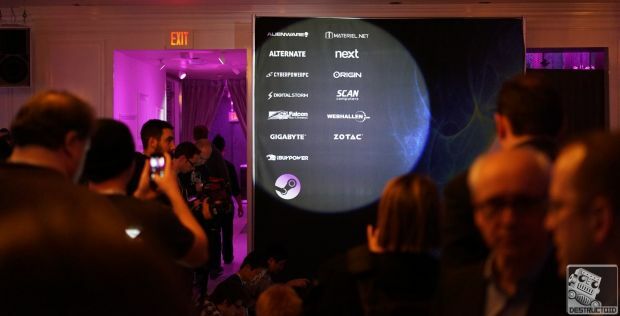 We're at Valve's CES press conference tonight, where Gabe Newell just unveiled 13 Steam Boxes. They literally ripped the covers off of 13 under-lit pedestals where each of the new boxes are displayed for attending press. Makers like Alienware, Origin, Digital Storm, and Falcon Northwest are in attendance to field questions on their new boxes. Just beyond these displays are kiosks where the Steam controller is available for testing with games like Portal 2. We have some terrible low-light photos for you to check out while we push our way through the crowd to get a better look. It's an absolute sh*tshow right now. Check out how small that Gigabyte one is!